McHenry High School students participated in a float building event for homecoming Monday, October 1, 2012 at the City Garage in McHenry. A parade, with this year's theme of "Wish Upon a Star," will be held Friday, October 5 at 2PM before McHenry faces Johnsburg in a home football contest. Mike Greene - mgreene@shawmedia.com McHenry East High School Senior President Makayla Mizser, 17, speaks with fellow classmates about float ideas during a float building event for McHenry High School's Homecoming Monday, October 1, 2012 at the City Garage in McHenry. A parade, with this year's theme of "Wish Upon a Star," will be held Friday, October 5 at 2PM before McHenry faces Johnsburg in a home football contest. 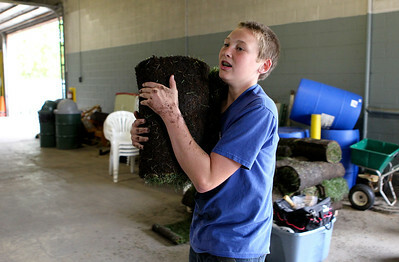 Mike Greene - mgreene@shawmedia.com McHenry West High School freshman J.P. Dudley, 15, hauls a load of grass to a float during a float building event for McHenry High School's Homecoming Monday, October 1, 2012 at the City Garage in McHenry. A parade, with this year's theme of "Wish Upon a Star," will be held Friday, October 5 at 2PM before McHenry faces Johnsburg in a home football contest. Mike Greene - mgreene@shawmedia.com McHenry East High School seniors Jessica Tarenski (front), 17, and Taylor Korus, 17, put up streamers on a float during a float building event for McHenry High School's Homecoming Monday, October 1, 2012 at the City Garage in McHenry. A parade, with this year's theme of "Wish Upon a Star," will be held Friday, October 5 at 2PM before McHenry faces Johnsburg in a home football contest. Mike Greene - mgreene@shawmedia.com McHenry East High School sophomores Katelynn McManus (left), 15, and Caitlyn Busse, 15, laugh while stapling chicken wire to the side of a float during a float building event for McHenry High School's Homecoming Monday, October 1, 2012 at the City Garage in McHenry. A parade, with this year's theme of "Wish Upon a Star," will be held Friday, October 5 at 2PM before McHenry faces Johnsburg in a home football contest. Mike Greene - mgreene@shawmedia.com McHenry East High School junior Hope Schneider, 16, cuts out a drawing of a moon during a float building event for McHenry High School's Homecoming Monday, October 1, 2012 at the City Garage in McHenry. A parade, with this year's theme of "Wish Upon a Star," will be held Friday, October 5 at 2PM before McHenry faces Johnsburg in a home football contest. Mike Greene - mgreene@shawmedia.com McHenry East High School junior Jacqueline Arevalo (left), 16, helps West seniors Josie Hobbs (center), 17, and Laura D'Angelo, 17, cut out styrofoam stars during a float building event for McHenry High School's Homecoming Monday, October 1, 2012 at the City Garage in McHenry. A parade, with this year's theme of "Wish Upon a Star," will be held Friday, October 5 at 2PM before McHenry faces Johnsburg in a home football contest. 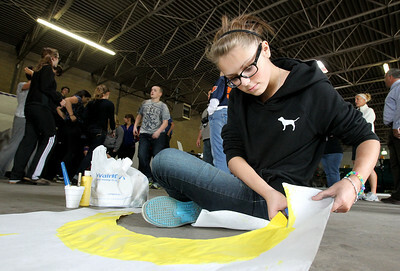 Mike Greene - mgreene@shawmedia.com McHenry East High School sophomore Sydney Jozwiak, 15, writes a slogan on a sign during a float building event for McHenry High School's Homecoming Monday, October 1, 2012 at the City Garage in McHenry. A parade, with this year's theme of "Wish Upon a Star," will be held Friday, October 5 at 2PM before McHenry faces Johnsburg in a home football contest. 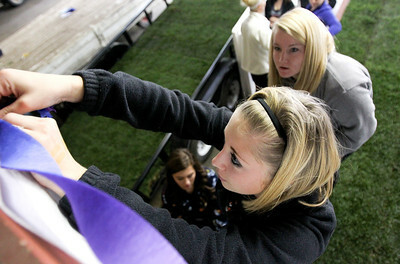 Mike Greene - mgreene@shawmedia.com McHenry West High School freshman Katie Harris, 14, stuffs chicken wire with colored tissue paper during a float building event for McHenry High School's Homecoming Monday, October 1, 2012 at the City Garage in McHenry. A parade, with this year's theme of "Wish Upon a Star," will be held Friday, October 5 at 2PM before McHenry faces Johnsburg in a home football contest. 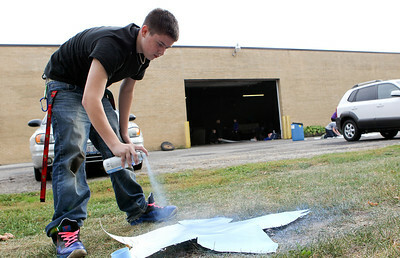 Mike Greene - mgreene@shawmedia.com McHenry West High School sophomore Jon Arnswald, 15, spray paints a star during a float building event for McHenry High School's Homecoming Monday, October 1, 2012 at the City Garage in McHenry. A parade, with this year's theme of "Wish Upon a Star," will be held Friday, October 5 at 2PM before McHenry faces Johnsburg in a home football contest. McHenry East High School Senior President Makayla Mizser, 17, speaks with fellow classmates about float ideas during a float building event for McHenry High School's Homecoming Monday, October 1, 2012 at the City Garage in McHenry. A parade, with this year's theme of "Wish Upon a Star," will be held Friday, October 5 at 2PM before McHenry faces Johnsburg in a home football contest.